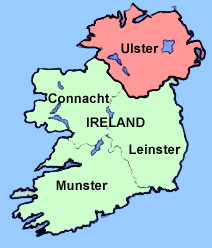 During the early 17th century, the first Bradshaw families came to Ulster and settled in the newly created estates of counties Antrim, Armagh, Cavan, Down and Monaghan. Some came through the invitation of land owners, others through marriage arrangements and as soldiers who remained after Cromwell's Irish campaign ended. 1620 - Richard Bradshaw was buried in Bangor Abbey Churchyard, Co Down. c.1630 - George Bradshaw, gentleman of Bradshaw in Derbyshire, married Elizabeth Callum, daughter of Sir Hugh Callum and Mary F Emerson of Cloughwater, Co Cavan. 1639 - Town Book, Corporation of Belfast, a George Bradshaw was listed as a merchant. 1657 - Capt. James Bradshaw married Ann Patterson in the Main St, Carrickfergus, Co. Antrim. 1659 - Census of Fermanagh records a Thomas Bradshaw, gent living in Drumcru Townland, Parish of Clownish (Clones) - three persons in household, all of whom are of English origin. c.1660 - John and Jane Bradshaw and their five children were living at Lisabuck, Killeevan, Co Monaghan. 1664 - James Bradshaw, Drumnecally, listed on Hearth Money Roll Co. Armagh, , one hearth. Benjamin Bradshaw of Hillsborough had three daughters baptised in Cathedral Church; Lisburn, County Antrim; Agnes - 1666, Margaret - 1669 and Rose - 1672.